Last month, my wife Mary and I were traveling through central Japan. This involved a lot of train travel, experiences I described in a prior post (see it at: http://modelingthesp.blogspot.com/2017/06/riding-trains-in-japan.html ). The trip also involved the discovery of a superb new railway museum at Kyoto. It opened quite recently, in April 2015, as a major renovation and expansion of an existing museum, the Umekoji Steam Locomotive Museum. 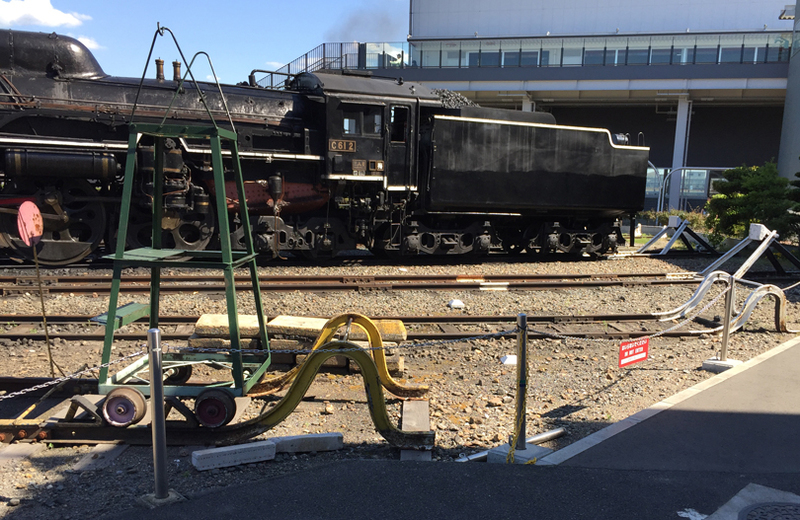 The Umekoji already held an extensive collection of railroad equipment, including many steam locomotives, and the Osaka Museum collection was added to it, as the aging Osaka facility was closed. I have been to many railway museums around the world, and this Kyoto facility is absolutely top rank, certainly among the very best anywhere. I might rank the York museum in England above it, and the California State Railroad Museum in Sacramento as its equal, but the Kyoto facility is definitely in that company. Shown below is the museum entrance plaza, with groups of elementary school kids waiting to enter. 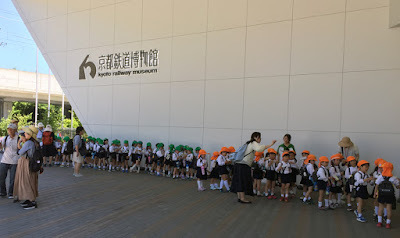 They are all in uniform, with different hats from different schools. 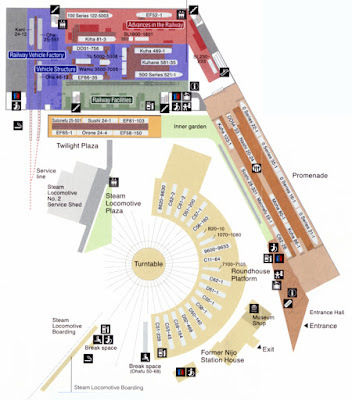 Shown next below is a map of the ground floor of the museum (it also has a large amount of displays on a second floor, and a third floor with a superb viewing platform for the action in and out of the nearby main Kyoto station). You can click to enlarge. The photo above was taken at the extreme lower right corner of this map. The 20-stall roundhouse dominates the plan. But many pieces of equipment are also displayed in the “Promenade” area, shown above at right in brown, including one of the original Shinkansen (Bullet Train) trainsets, called “Model 0” today. The upper rectangle on the map is the main building, with its three floors and many pieces of equipment on display. The whole museum currently displays 53 locomotives and cars. 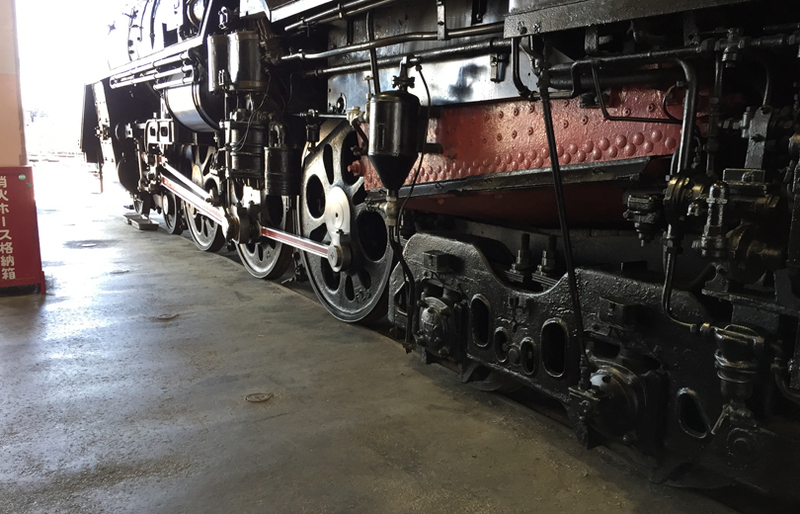 The photo below is the nose of the “Model 0” train. The roundhouse full of preserved steam deserved more time than I could spend, but most of the engines were very handsome to my eye. All are 42-inch gauge. One example is this 4-6-4 or Hudson type (in American nomenclature), a C62-1 class on JNR. Very nice lines. The action we saw that afternoon was one of the excursion locomotives (there were two under steam) being turned on the turntable and then backed onto a garden track. It was a 2-8-2 or Mikado type, in JNR classification D51-200. Again, a very handsome locomotive to my eye. Here you see it backing off the turntable. For a non-Japanese visitor, the museum does have one drawback, in that very few displays have English descriptions (beyond just the name of the item). But there is an English brochure, and for the knowledgeable railroad enthusiast, you do know what you are looking at in nearly every instance. Though I had not planned to visit this museum as part of our group travel, a very timely free afternoon in the schedule made it possible, and it was a highlight of the entire trip for me. I hope to go back sometime and spend a full day or more! A major announcement and new car release took place at the St. Louis RPM meeting this past weekend, concerning a new HO model by Tangent Scale Models. It is an insulated 8000-gallon tank car on a 1917-design General American underframe (called “Type 17”). It is a superb product and like nearly all Tangent releases, was kept secret until now. 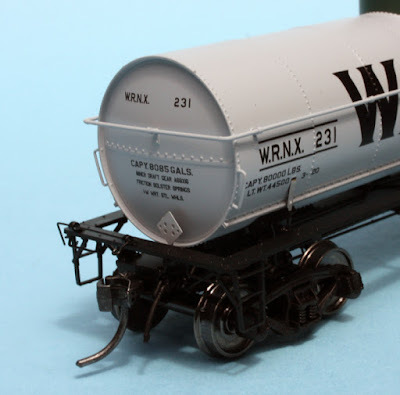 And I should say at once that these new cars, like all Tangent tank cars I have seen, are truly excellent models. I could not resist buying two of them, which I show below. Both are noteworthy in different ways. The Warren Petroleum car has a gray tank, which is exactly right prototypically, despite the many models over the years represented as aluminum-painted tanks. 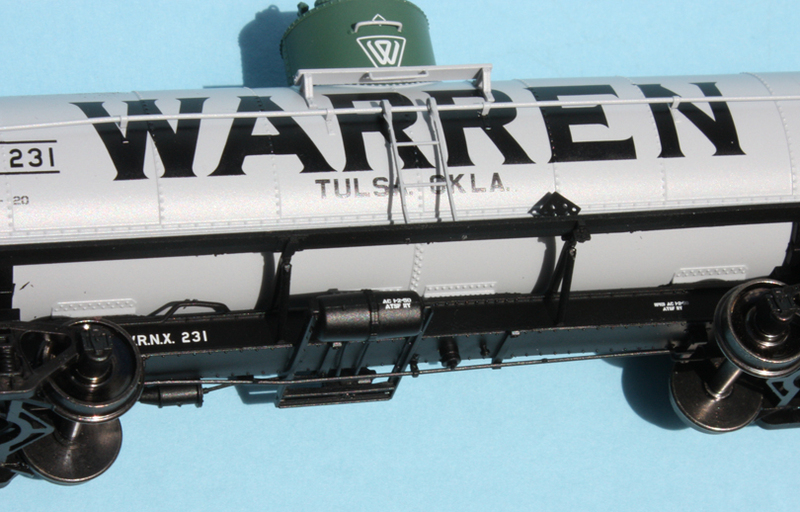 Richard Hendrickson campaigned tirelessly for gray Warren tanks, and finally here is one. 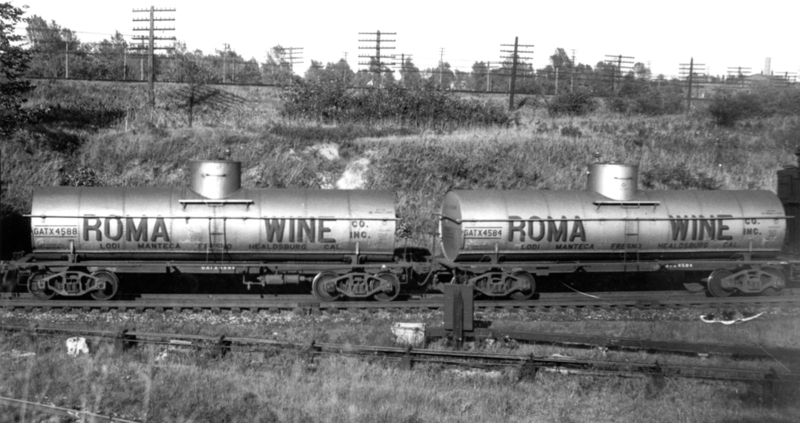 The Roma Wine Co. tank car, leased from GATX, is also noteworthy, as it exactly matches a prototype photo, which I will show in a moment. But first, the models. You can click to enlarge the image. Note that the insulated jackets do have riveted seams, as was typical before World War II. Here is the prototype photo of two leased Roma cars, from the Richard Hendrickson photo collection. Date of the photo is 1935. Note here that the initial “R” in Roma is accurately reproduced on the model, as you can see by comparing this photo with the one above. As we have become accustomed to seeing on Tangent models, the lettering is excellent, both sharp and complete. To illustrate, here is the end of the Warren car. Also note in this view the nicely rendered two-rung sill steps typical of General American practice. The same quality extends to the normal lettering on the center sill and AB reservoir. The Warren emblem on the dome is also well done. The brake gear is suitably chosen for the era of each car (AB or K brakes.). Shown below are the AB brake parts on the Warren car. As you can see, the system is fully piped and has all brake rods also. The Roma car lettering is likewise very well done, and follows what can be seen in the prototype photo above. For example, here is the lettering at the right of the car side. The dome top is interesting, as it has a screw-top type of manway cover, entirely appropriate for a commodity like wine, and a frangible-disk safety vent, along with the usual spring-loaded safety valves. 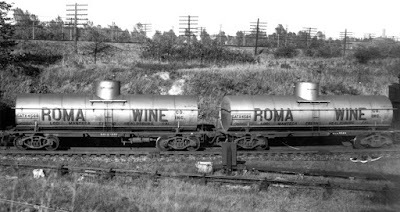 The safety valves could have already been in place on an older tank car converted for wine service, as this car must have been (when it was built, Prohibition was in force). 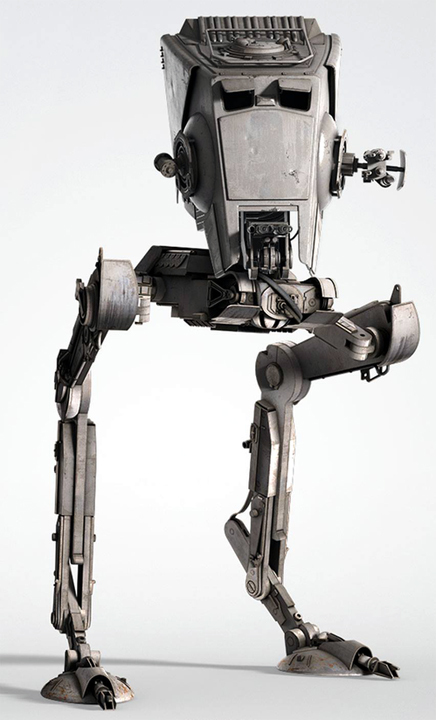 There was no need to remove safety valves with the change in cargo. But the prototype photo above does show that the safety valves had been removed on GATX 4584 and 4588, so I will do the same on my model. 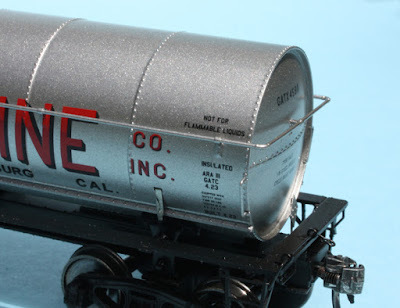 This is a most welcome release by Tangent (not least because we have not had a good 8000-gallon insulated tank car in HO scale), and shows them taking advantage of the Type 17 underframe they had already created for their prior release of circumferentially-riveted tank cars awhile back. Possibly we will see additional bodies on this underframe, which is certainly to be hoped. But for now, congratulations to David Lehlbach and his team at Tangent, for another terrific model. 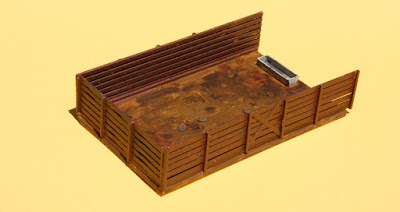 Years ago, when the first etched-metal running boards became available in HO scale, I thought they looked quite nice, far better than the usual model boards of that day, which were typically plastic around 2 scale feet thick and with utterly minimal indentations to look like a metal grid. I wanted to try an etched metal version on a freight car in my fleet, and when I did so, I was happy with the result. I immediately planned to continue replacing one or two more at a time, as modeling priorities and budget would permit, and gradually upgrade the whole fleet. But that first car ruined the plan. It looked so good, and made the clunky plastic versions look so bad, that I simply had to buckle down and replace all the terrible old running boards. I did just that, and have kept to that standard ever since. (I said more about my freight car standards in an article for Model Railroad Hobbyist in the issue for February 2017; you can read online, or download, any issue of MRH at any time, for free, at their website, www.mrhmag.com .) But that isn’t the end of the topic. This post is about a related problem I have with some of my freight cars, namely some SP box cars, and also about a different solution than what I’ve done in the past. First, the background of the problem. 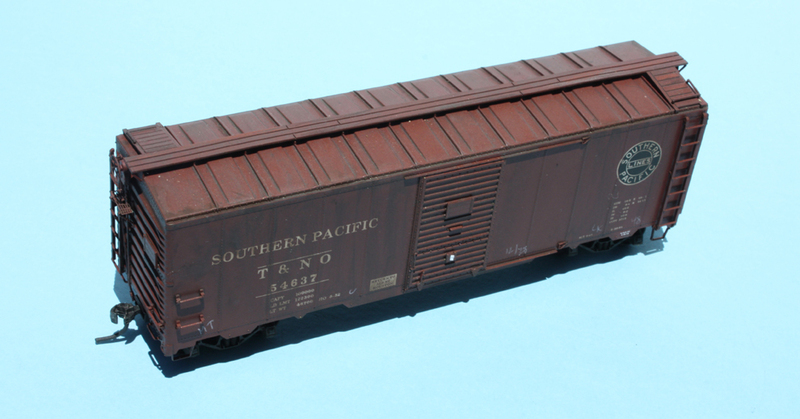 When SP first began to purchase the new 1937 AAR standard 40-foot box cars, they were built with wood running boards. This was classes B-50-18 and -19, built in 1936 and 1937. But when they resumed purchases of cars like this in 1940, the car end design had been changed to a rounded-corner design ( or W-corner-post), and also, running boards were chosen to be steel grid, usually Apex. These were classes B-50-20, -21 and -23. All this history and much more is in Chapter 11 of my book on SP box cars, Volume 4 of the series Southern Pacific Freight Cars (Signature Press, Berkeley and Wilton, 2006, revised edition 2014). 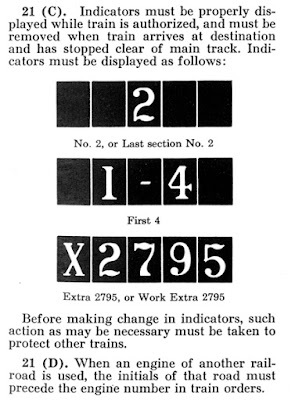 The problem comes in the various SP models that have been produced, with car numbers lying in the W-corner-post car group, but with wood running boards represented. I have a couple of such cars, from Red Caboose or Innovative Model Works, and would like to upgrade them. Etched metal is of course an option, but Kadee now sells their superb plastic version of a steel running board, and I wanted to give this running board a try. That’s the “different solution” I mentioned. Here are two available colors. 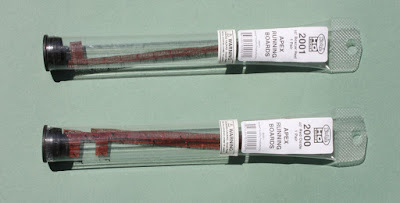 As you see, the “red oxide,” Part 2000, and the “boxcar red,” Part 2001, come two to a tube and it turns out they are easy to fit to a car roof.You can learn more at their website, https://kadee.com/index.shtml , and can purchase parts on-line if you don’t have a local hobby shop. Shown below is an as-built model of a T&NO car with a number falling into Class B-50-21, which I know from my book chapter to have had an Apex running board, which is what the Kadee board represents. My first step, then, was to remove the kit’s wooden running board. I easily removed the kit board by slipping a razor blade underneath it to cut the plugs inserted into the roof. Here is the car roof after this removal. You can see the stubs of the roof plugs. The Kadee “boxcar red” color was closest to my model, so I applied one of those. The new running board was attached with canopy glue. Of course the rest of the model is already weathered, so after removal of the old running board, the new one has to be given some weathering to match. I simply sprayed the new walk with Tamiya Clear Flat (which I really like, it is truly flat). to provide a working surface for my usual acrylic-wash methods (for more on that, see the reference pages at the upper right of this page). 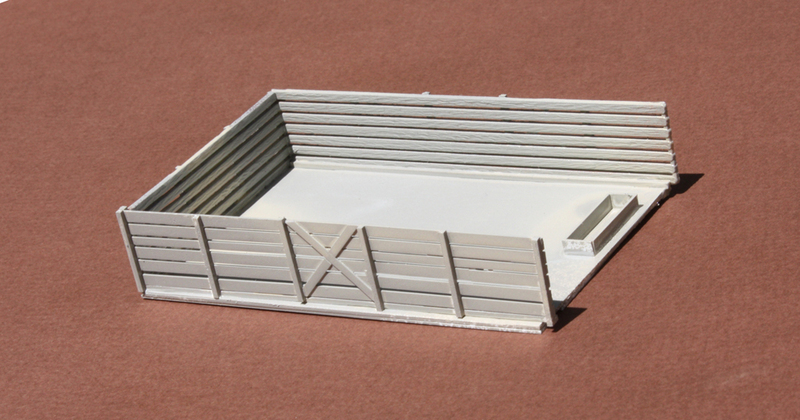 Here is the new roof appearance, before weathering. The color of the new running board is in fact quite a good match to the original color of this model, as I was able to determine with the underbody paint on the car (this particular model had not had any weathering done on the underbody). This running board replacement was quick and easy, and I am happy with the Kadee running board on the car. It’s true that it has much heavier grid parts than the prototype, more so than the etched metal running boards, but it is fairly thin vertically, and you can see through it, as you should, so I feel it is acceptable, and it is very simple to apply. I am sure I will do more of these replacements. 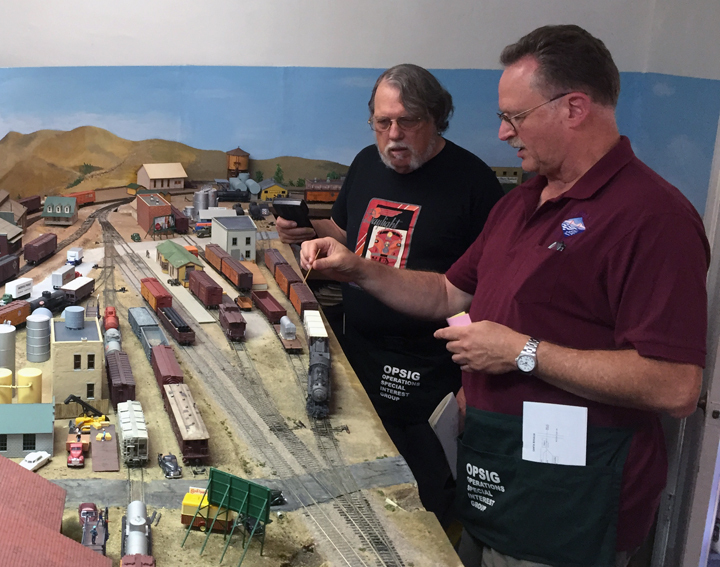 Once again, the annual June meeting called Bay Area Prototype Modelers (BAPM) has taken place, and it happened last Saturday, the 17th. The venue, for several years now, is a private school in Richmond, California and it serves very well for a meeting like this, attended by 150 to 175 people. There is a kitchen at one end of the multi-purpose room that we meet in, so that snacks and lunch are available too. This was the 14th such event in this series, and this year it included 17 vendors. The models displayed by attendees are naturally the centerpiece of a meeting like this, but vendors are an important added attraction, and this year had a good group of them. A highlight of every meeting is Elizabeth Allen’s diesel modeling. She always brings a number of completed locomotives, but to me the in-progress projects are in some ways more interesting. For one thing, you can recognize more easily the amount of work required for really accurate modeling of specific locomotives, and can also see her craftsmanship. 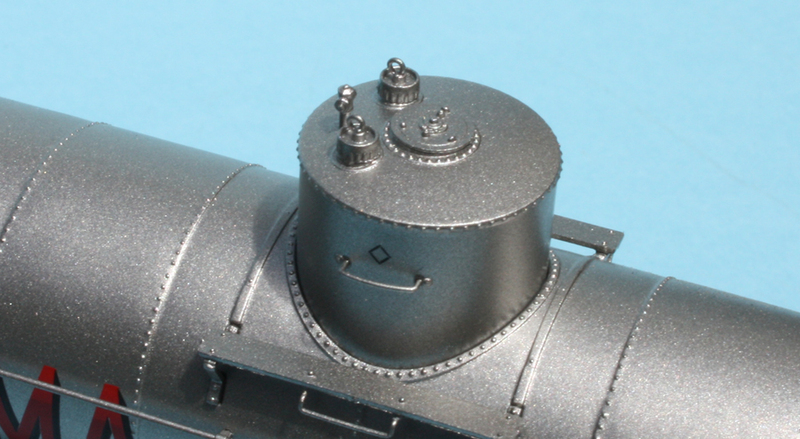 I know there are modelers who (mistakenly) believe that kitbashing diesel locomotives is not that big of a deal, but you only need to look at the Cannon doors neatly added to the long hood of this model in progress, to contradict that idea. Fit and location are simply perfect. I really liked the modern modeling of Jay Davis, who has added flamboyant graffiti to several models without exactly copying specific prototypes, I kind of admire the most artistic of these efforts in the prototype, so enjoyed seeing these models. Shown below are two examples of his work. Upon discovering that the model parts happen to be pretty close to HO scale, Glen thought, “. . . why not?” I would have to say, “good one, Glen,” since viewers mostly didn’t recognize the parts immediately but did figure it out in short order. Another of those whimsy moments, I suppose. 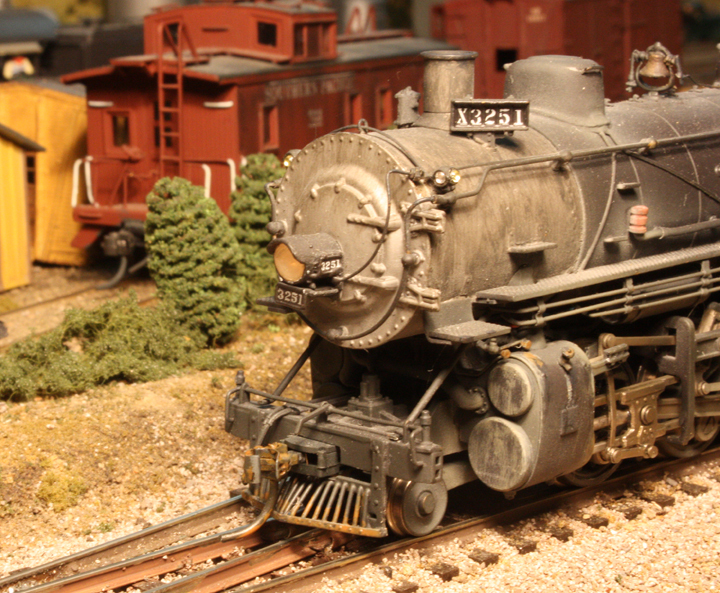 The lead car here is a Sunshine model of a C&NW rebuild of one of their numerous USRA box cars. 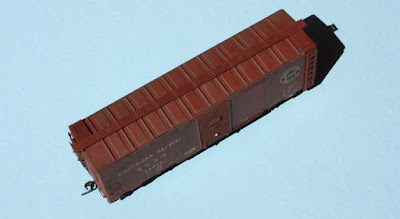 Second is a member of the huge NYC fleet of “USRA design” steel box cars, of which over 17,000 were still in service in 1953, when I model; it is a Broadway Limited product. And third is one of the thousands of Santa Fe box cars rebuilt from classes BX-11, -12 and -13 with raised roofs. It’s a Westerfield kit. All three were in the clinic and the articles. This is just a sample of the 15-car train. I would say this was another successful year for BAPM, and I look forward to more of them in the future. Like any regional RPM gathering, it is a great opportunity for serious modelers to meet and greet and, maybe, enjoy some humor like the Star Wars flat car load. In the previous posts in this series, I have shown several aspects of figures, as I prepare them for use. 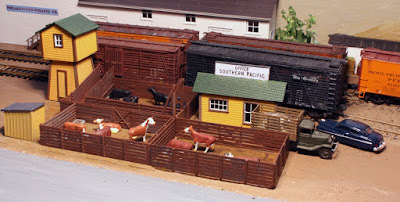 (The most recent post, concluding my comments on painting, is at this link: http://modelingthesp.blogspot.com/2017/05/figures-part-5-more-on-painting.html .) But they also need to be placed on the layout in sensible and believable ways. I will try and illustrate what I believe is effective placement. First, the figure working alone, or standing alone, is perfectly realistic, provided the work being done looks all right in the “freeze motion” of figures on a layout. Just as the figure of a baseball player leaping to catch a ball looks odd when “frozen,” so does the track worker with a sledge hammer at the top of the swing. So the solitary figure should be doing something that makes sense, or else simply standing at ease. Second, a figure just standing, while perfectly possible, is a little odd for an extended time. I used to have a single person standing outside the waiting room of my depot at Shumala. This is an excellent Preiser figure. But one might wonder why he is standing there. The best way to make this look all right is to add a second figure. It looks like they are conversing, a situation in which two figures may well stand still for some time. Workmen may well fit the same pattern, two people working together. You need to find two figures who can appear to cooperate in a task. 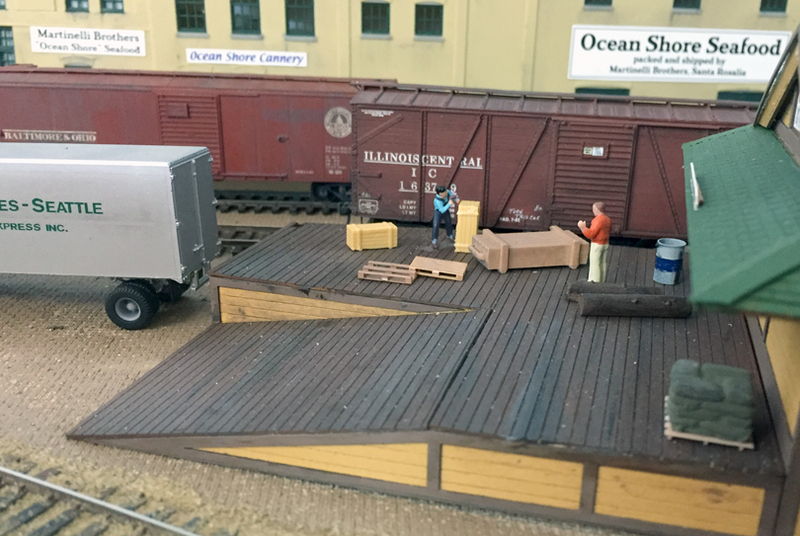 I have posed two figures like this, on the loading dock of my depot at Santa Rosalia. 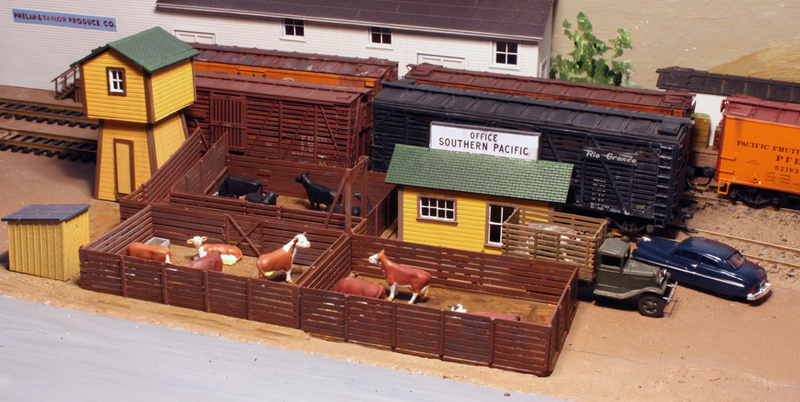 Other groupings, not of workmen, may suggest themselves by the structures and businesses you include on your layout. I made some picnic tables for an outdoor serving area near my Dolphin & Anchor tavern (which I described awhile back, in this post: http://modelingthesp.blogspot.com/2013/02/signs-for-structures.html ). The tables were easy, just using scale 8-inch-wide styrene strip and arranging them exactly like the tables you might see in any park or campground, and glued together atop wax paper on a little sketch of the leg angles. Here’s a view from underneath which shows the construction. 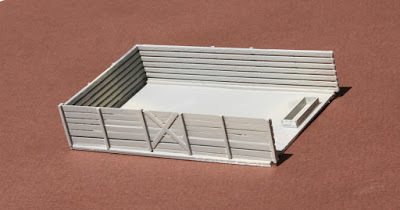 I used a couple of these for my tavern serving area, and used figures from “seated travelers” sets to populate them. I do need to add a waitress here somewhere. But I think this does make a believable scene of tavern customers enjoying an outdoor seating area. No doubt most modelers could readily multiply examples of figure placement, good and bad, but I think it’s an aspect of using figures that deserves thought. I plan to return to this topic in a future post. The Operations Special Interest Group or OpSIG has just published an outstanding book about prototypical operating practices and how to implement them on a model railroad. 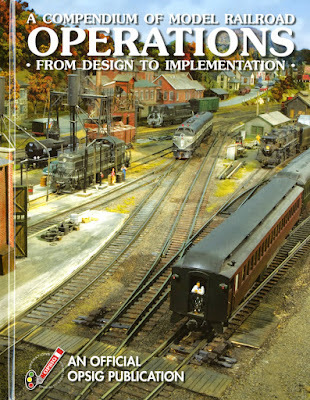 Its full title is A Compendium of Model Railroad Operations, but many are already referring to it simply as Operations. It can be purchased on their website at: http://www.opsig.org/OPSigBook2.pdf . Shown below is the cover. The authors are a “who’s who” of model operations authorities, from Jim Providenza and Seth Neumann to Steve King, Brian Lundberg, Dave Clemens, Mike Burgett, Byron Henderson, and others. The ringmaster who brought it all together and edited the book is Phil Monat (who also contributed a chapter), together with his co-editor, Steve Benezra. I must confess to a small personal role in the project, as some of the authors, as well as editor Phil, called me for photos they could use, and you will see a few images contributed by me in the book. This is really an outstanding collection of articles, one that goes far beyond anything previously published in this area. 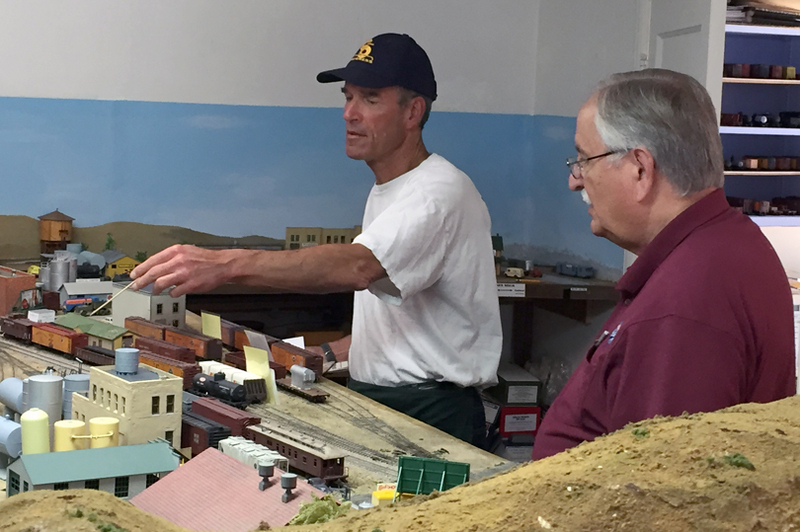 The pioneer book for many of us was Bruce Chubb’s comprehensive volume, How to Operate Your Model Railroad. That book was succeeded in the Kalmbach stable by Tony Koester’s two editions, both entitled Realistic Model Railroad Operation ( I reviewed that book in a previous post, at this link: http://modelingthesp.blogspot.com/2014/03/tony-koesters-recent-operations-book.html ), though Tony’s books. limited in length by Kalmbach marketing goals, are less detailed than Bruce’s book. I often advocate that beginners need both books. But this new OpSIG book carries things to a far more advanced (and thus interesting) level. Incidentally, this is the second book published by OpSIG. The first, “19 East, Copy Three,” is about timetable and train order operations. I have mentioned it in previous posts (for example, in my 2013 post at: http://modelingthesp.blogspot.com/2013/09/setting-up-operating-session.html ). The first printing of that book sold out, but it’s been reprinted and is also available for purchase at the OpSIG website. 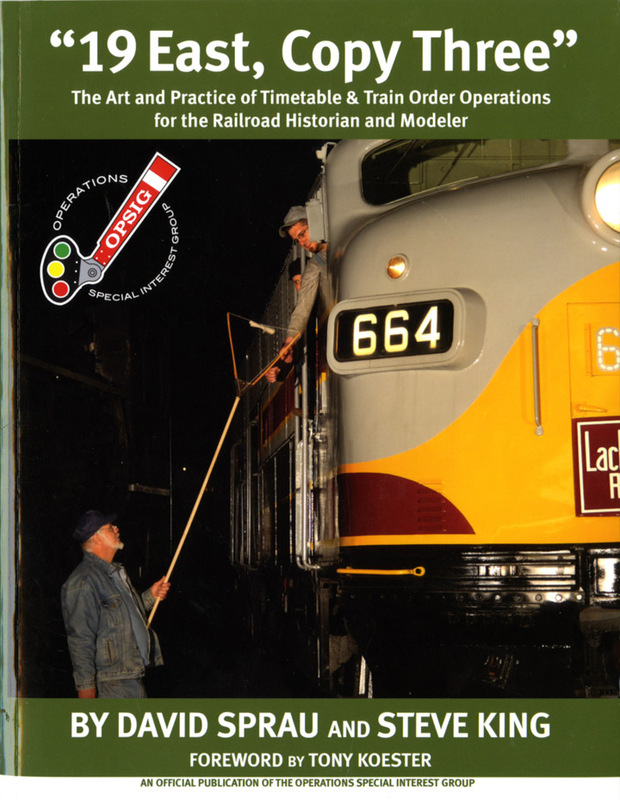 It is a superb complement to the Operations book just described, and I recommend it highly. Here is its cover. The new program of the OpSIG to publish operating information in book form is greatly to be commended. I am impressed at the ambition and successes of the program so far, and will look forward to what they can do in the future. And if you have any serious interest at all in model railroad operations, you definitely need to buy A Compendium of Model Railroad Operations. I have been modifying the operating scheme I use on my layout, to add more realistic car movements and also to create more complexity in a few places. As visiting operators become familiar with the layout and its original simplified scheme, the operators have finished the sessions in less and less time. I therefore decided to remove some of the simplicities and see how it would go. But as happens all too often, in testing the various layout areas before the op session (once track is cleaned, I usually operate locomotives through all switches and sidings to ensure everything works properly), I found some problems. One was a dip in the track, the other two were areas where track gauge was too tight. Most of this track has been in place for years, and all three problems were new. I couldn’t help but remember the often repeated observation of Jim Providenza, who has hosted operations on his layout for many, many years: “Track will move around and change gauge. It happens. Layouts aren’t stationary.” He is of course right, and I am only one of the many who can validate his comment. Naturally I tried before the sessions to correct the problems I found, but was only partly successful, as the sessions would soon demonstrate. On June 10 and 11, I hosted the same operating session each afternoon. The operating scheme part of all the sessions went well and I had the impression that the changes that I had made folded smoothly into the overall operation. On June 10, the two crews were Seth Neumann and Mark Schutzer, and Bob Osborn and John Sutkus (seen below at Ballard, with John at left). All four are very experienced operators on numerous layouts, and I was confident they would be able to handle all the changes. They did. The second crew is shown below as they worked at Shumala; Seth is at left and Mark at right. They found a couple of my track problems (I had fixed one successfully the night before the first op, but the others remained). After the June 10 session, I worked late in the evening to try and fix a tight-gauge problem at Ballard, and though I made it better, there remained an issue with the rails not being quite all in one plane right at the points of a switch. All I could do was warn the crews on the 11th to watch the locomotive running through that area, and they did indeed have frequent problems there. On this day, one of the crews, shown working at Ballard, was Pat LaTorres (at left) and Ed Slintak. 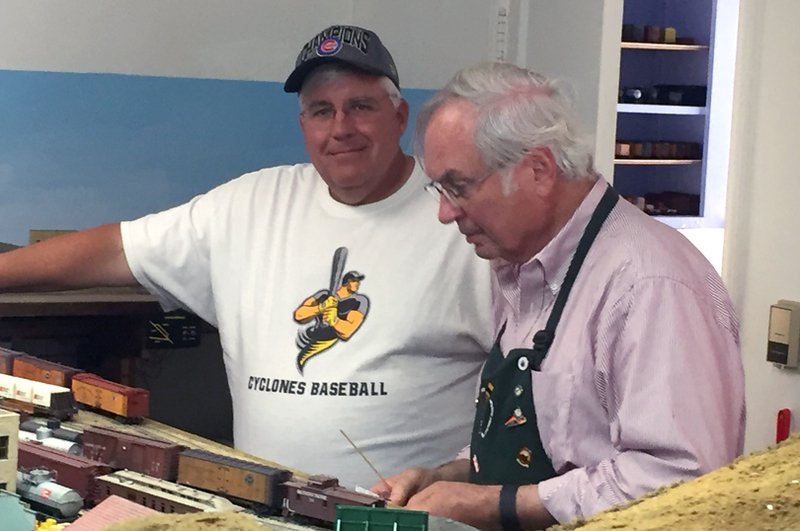 The other crew on Sunday were Jim Radkey and Jon Schmidt (Jim is at left below, as they take their turn to switch at Ballard). Jim was a last-minute fill-in for someone who wasn’t able to attend, so I appreciate Jim’s willingness to join the operating session on short notice. I have been working on the Ballard track issue since the op session, and as solutions (hopefully) develop, I will write a post or two about them, if anything in the solutions is of general interest. I am also trying to avoid falling victim to what Paul Weiss calls “Host Flaw Hysteria,” in which a host imagines a small flaw in an operating session to expand so large as to eclipse everything that went well in the session. I know all these operators enjoyed most of their work in these two sessions, so I will try not to feel excessively disappointed about a couple of track problems. But I still need to get them fixed. During much of the month of May, my wife Mary and I were traveling through Japan, starting in Tokyo and seeing much of central Japan, including the Japanese Alps, and then heading south and west to end our trip on the island of Kyushu, at Fukuoka. The long-distance and even some local travel was by train. That’s what I want to write about in this post. The bullet-train system of Japan, the Shinkansen (which just means “new trunk line”), has been around more than 50 years, with the first trains entering service in 1964. So it’s not exactly a new idea, but the Japanese have continued to innovate, improve, and increase speeds. Those are reasons the Japanese continue to be leaders in much of this technology. 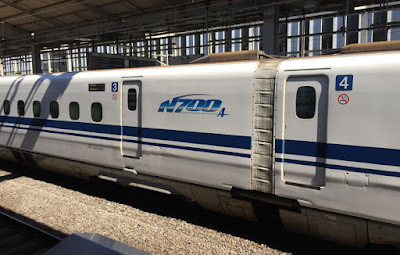 We first rode the oldest of the lines, the Tokaido line, which connects Tokyo and Osaka. 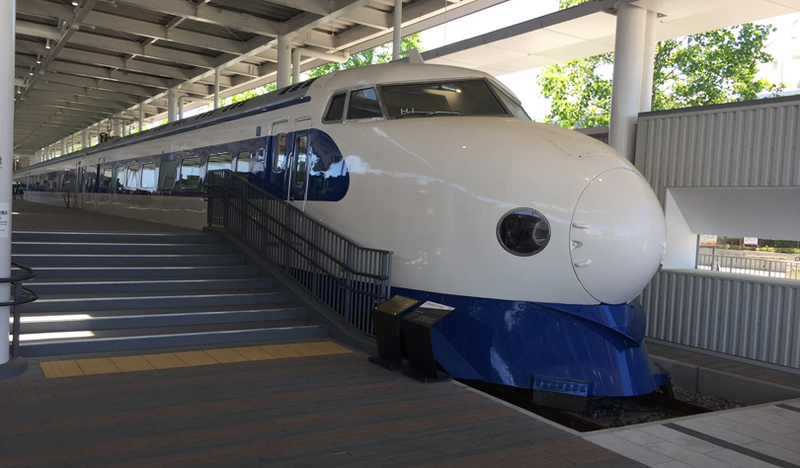 Though it initially operated at 125 miles per hour, its speed has been progressively increased, with the current N700 trainsets normally running at 180 miles per hour. Naturally these are now far more aerodynamic than the 1964 trains. 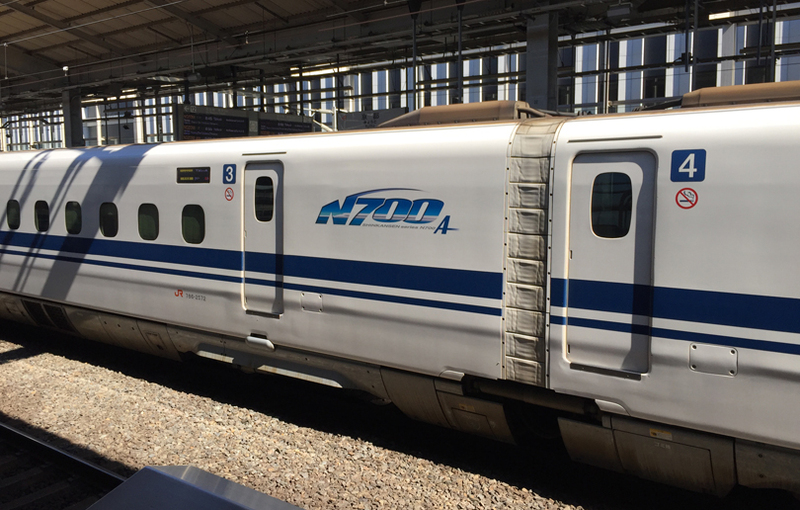 Here is the end unit on an N700 trainset (both ends are the same). Perhaps the most surprising aspects of all these train are the passenger densities. They are very high on most lines, with the Tokaido line remaining the busiest, carrying more than 150 million passengers per year. At the busiest times of the day, morning and late afternoon, there are 13 trains per hour on this line alone, little more than 4 minutes between trains. These are 16-car trains, with 1323 seats per train, and it is indeed dramatic to witness the very rapid boarding and exiting of passengers. Here is a shot of a couple of the 16 cars in an N700 train. 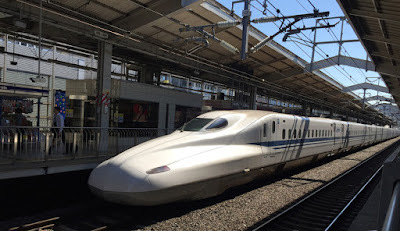 Of course Japan is not all Shinkansen trains. First of all, there are shorter routes of all kinds, along with local train service. The vast majority of Japan is still the 42-inch gauge recommended originally by British consultants when railway construction began in Japan (this gauge is rightfully called “Empire gauge” for its prevalence in many parts of the former British Empire). But the Shinkansen lines, specially constructed for the very high speeds, are all “global standard gauge” (4 feet, 8.5 inches). We rode a bunch of these local trains too, in many different areas. For example, here is the very nice “express” we took from Takayama to Kyoto. 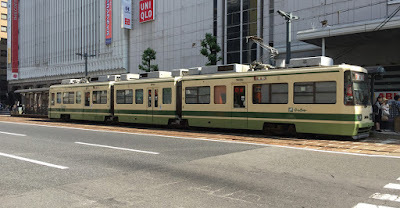 It was a six-car train, ad though most of Japan is electrified, it is diesel-powered. The cars were a very familiar size from U.S. practice, 68-seat coaches, 17 rows of 2 + 2 seating. Like all the trains, they were clean and comfortable, and with very adequate leg room. Probably among the most impressive things about Japanese railway travel is the number and length of tunnels. It’s a mountainous country, and every line we rode had tunnel after tunnel. The sheer investment is daunting. No wonder that tunneling is another technology in which the Japanese are leaders. 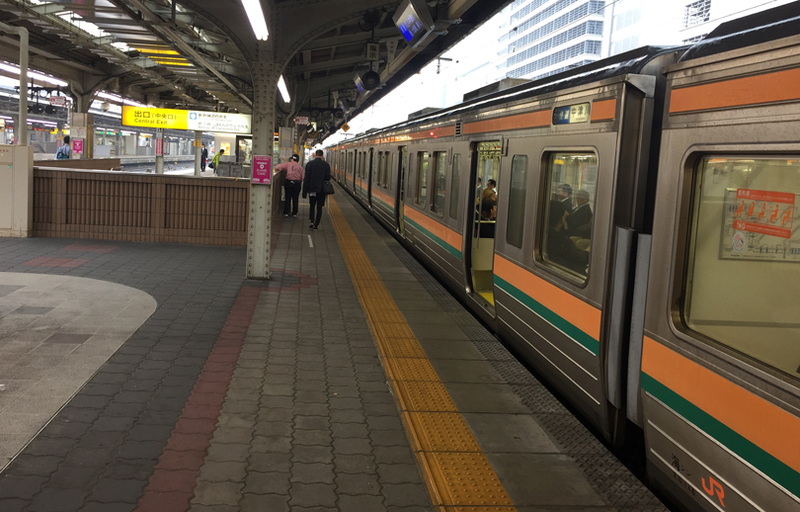 The biggest cities, like Tokyo and Osaka, have “heavy-rail” commute services mixed in with subways. In Tokyo we rode the Japan Railways lines several times, and these were less crowded than the subway (at least when we rode the two modes). Here is such a train. In the lower right corner you can see the JR emblem. The railway system in Japan was formerly government-owned and operated, under the name Japanese National Railway (JNR). 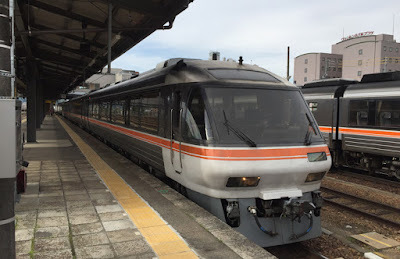 Since 1987, however, it has been privatized into seven companies, but they adhere to strict rules on maintenance, operating practices, and cooperation, and are collectively known as the Japan Railways Group companies, all branded as JR. Most Japanese cities of any size have replaced their streetcars with subways, but there are exceptions. 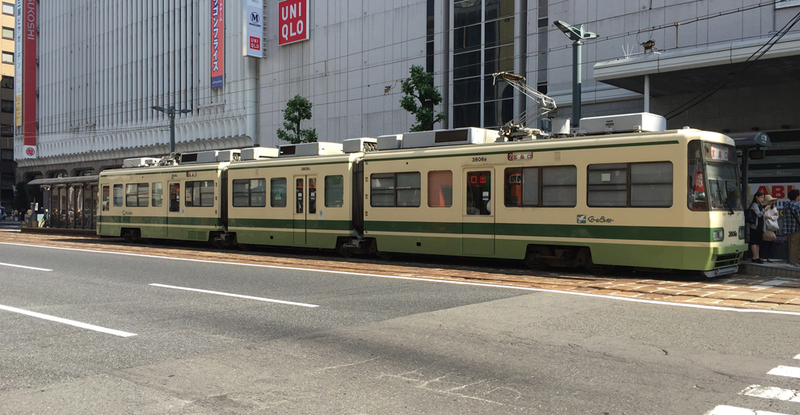 For example, here are typical streetcars in Hiroshima, modern and fairly quiet cars. Putting it all together, trains are really excellent transportation in Japan, fast, frequent and not excessively expensive. The only drawback for the traveler, as opposed to the commuter, is that hardly any trains have provision for luggage. 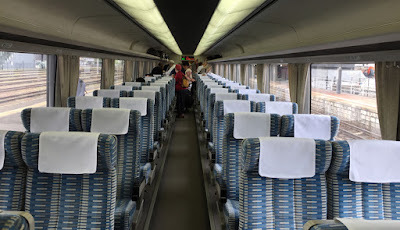 The overhead racks are not large, and there usually is no luggage section at the end of cars. But all in all, we really enjoyed our train experiences in Japan. We also visited a superb railroad museum in Kyoto, which I will describe in a separate post. 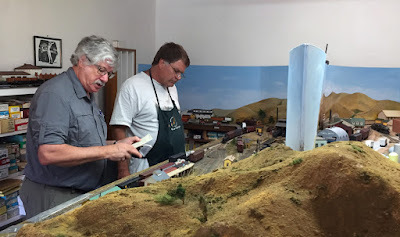 Most years I attend the Railroad Prototype Modelers fall meet in suburban Chicago (a meeting long known as “Naperville” for the then-site of the convention hotel, now called “Chicagoland” since it moved to a hotel a quarter of a mile away in the adjoining town). A highlight of these trips is a chance to operate on Bill Darnaby’s excellent layout, the Maumee Route. A couple of years ago, I filled the Yardmaster and Hostler jobs on the Maumee, and one part of hostling was the insertion of HO-scale white flags into flag stanchions on locomotives of extra trains. (Use of such flags is usually described in prototype rulebooks under Rule 21.) I thought it was a delightful touch of detail. Here is a photo of one of the Maumee engines, borrowed from Chapter 5 of Tony Koester’s book, Model Railroading from Prototype to Layout (Kalmbach Books, 2010). The white flags look great. On returning home from these trips, I thought, more than once, “I’d like to do those white flags on my layout.” Finally reaching the point of action, I began to browse my various sources of SP prototype photos to see how the flags looked, and quickly realized that there weren’t any. The answer must lie in the SP version of Rule 21, I thought to myself, and therefore looked at my 1943 and 1951 SP rulebooks to see how Rule 21 was presented. I have omitted the details for engines running backward, etc. 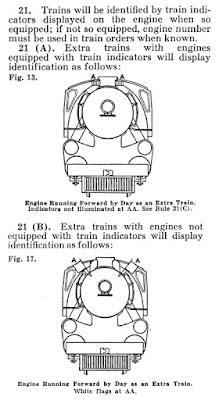 Rule 21(B) clearly shows that the only trains which would display white flags are those powered by engines that had no indicators. Indicators were entirely standard on SP steam, so lacking them would an unusual situation except perhaps for leased locomotives. 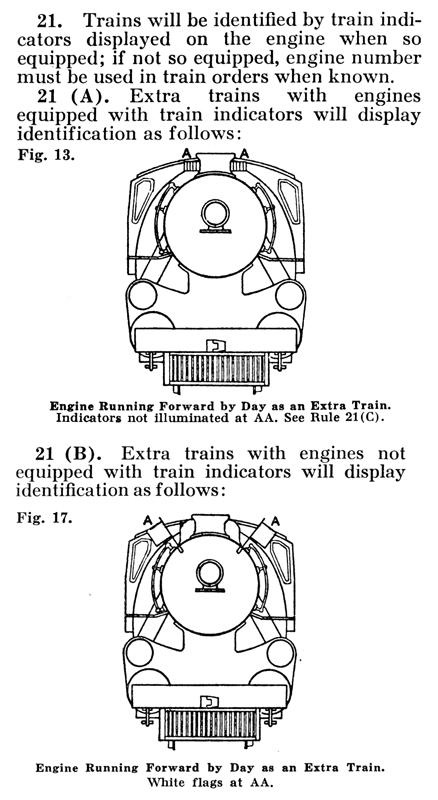 Note the headlight is illuminated, as SP Rule 17 required after World War II. In a way I am disappointed not to be able to carry white flags on the extra trains on my layout, but at the same time am glad to have learned the SP rule and what it means. 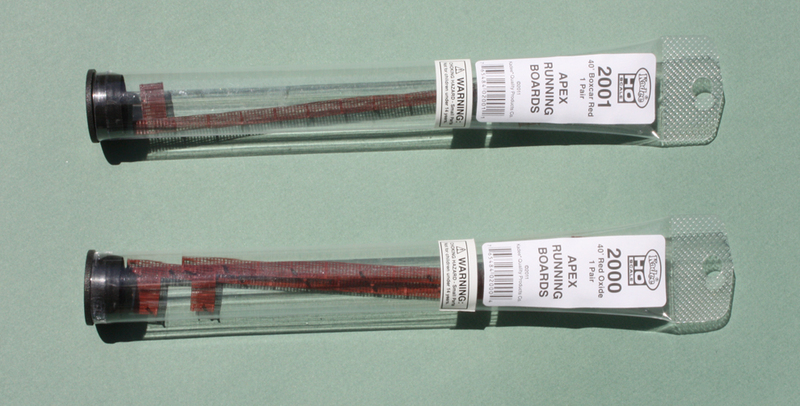 And my operators will be able to avoid the rather fussy task of putting HO scale flags into stanchions!